I’m extremely excited to get this message out to you. – it doesn’t even require you to do any of the work..
It’s actually pretty genius and makes total sense why it would increase your rankings. I am Excited to finally be able to share with you my Easy Video Suite Review. After waiting over a year to get my hands on this piece of software the wait was DEFINITELY worth it. I am more then happy with my investment and am having a blast playing with this new piece of technology. I feel like I’m a kid at a candy store. Most of you know that I’m a HUGE video marketer so getting my hands on new software is very exciting. In the next few paragraphs I plan on sharing with you a full review of Easy Video Suite and the cool features I’ve discovered so far. The great thing about Easy Video Suite is how quickly I was able to get it up and running. From the moment I purchased to the moment I was able to create my first video was all of about 10 minutes. The members area is extremely easy to navigate, there are tutorial videos for every step and nothing was too hard to understand. 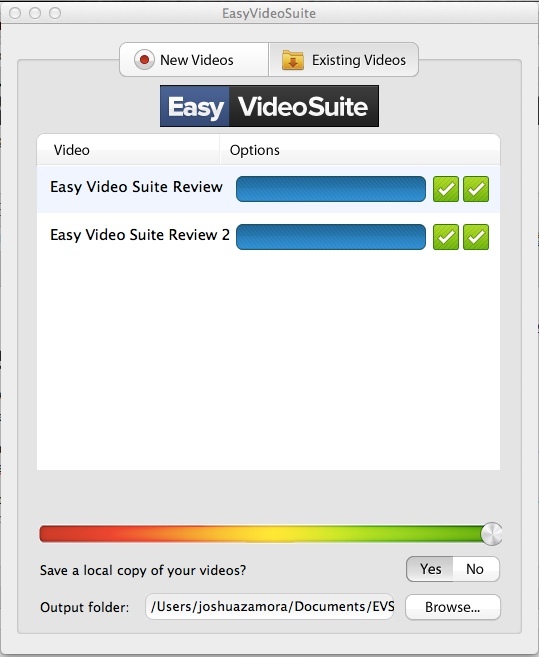 There are 2 ways that you can install Easy Video Suite. The quick and easy way is to install it within the members area and create a sub domain on their website evsuite.com and have them host your videos. I personally created my sub domain as zamurai.evsuite.com. For those of you who are more advanced you can install Easy Video Suite on your own server via FTP. They also provide a step-by-step tutorial that shows you how exactly how to get it installed on your server. I should have it up and running on this domain within the next hour or so. Easy Video Suite comes with a desktop application which is what is going to allow you to create new videos as well as upload existing videos into your dashboard or Youtube whichever you prefer. You can create screen cast videos or Face videos. A pretty cool feature I noticed is if you tick on the “save a local copy of your videos” it simultaneously saves it into your EVS dashboard as well as your hard drive. I found the desktop app extremely easy to install and get up and running. Being able to save a copy into my dashboard and my hard drive. Being able to upload direct to Youtube in HD quality. The Desktop app coverts the video automatically into several different formats so your videos are playable on all devices. Being able to easily add an intro an outro snippets to your videos once uploaded. Being able to redirect your viewers anywhere you want once the video is done. Being able to quickly create a page from your video and have it online within minutes. Being able to style the page to your liking with an easy drag and drop interface. Being able to add meta information to the page to make it SEO friendly. and a TON more that I have yet to play with…. Those are just a few that I use and tested it out when I got access to my account. I am really looking forward to continuing to use this software and really put it through the test. As I mentioned in the feature list above you are able to easily create and style a page for your videos with a simple drag and drop editor. I created the page below in about 10 minutes. Everything was really easy to move around, add to the page, remove from the page, etc. Do I recommend Easy Video Suite? ABSOLUTELY! I rarely get excited for new pieces of software but Easy Video Suite is definitely one of those product that comes around only a couple times a year that I truly get excited for. If you are looking to do anything with video marketing in 2013 this is a tool you want to get your hands on. I have put together a great bonus that compliments Easy Video Suite almost like a glove. Trust me I’ve looked around at other bonuses and a lot of them are just a CRAP load of random products just put together that have NOTHING to do with video marketing and are really not going to do you any good. EVS + ZCTA + ZVG = Formula for Video Success! The first amazing bonus is my unreleased “Zamurai CTA Bundle” product. This is a bundle of over 8 high quality bumper videos that you can add to the beginning and end of your videos to SKYROCKET the clicks to your affiliate links or link to your website. I’ve been personally using these high quality CTA’s with some great results All you have to do is add it to the beginning and end of your video so you can really “sell the click” and drive people wherever you want. It’s almost irrestible for your viewers to NOT click the links since it’s human nature to follow one’s eye’s to see what they are looking at 🙂 pretty genius huh? It did take me quite a bit of time and $ to put together those CTA bumper videos since I not only had to first buy the stock images which are $10 a piece…. …but I then had to put together the Power Point slides, Record the PowerPoint, edit the video in iMovie, add sound effects and finally produce the video. So what I am going to do for you is throw in ALL the powerpoint slides, stock images and where to get sounds effects for FREE with this bonus. This is going to allow you to edit the CTA bumper power point slides to your liking and even create your own. I even put together a video of how to create your own CTA bumper videos with the slides and images to make it easier for you. My 3rd Bonus is yet another JUICY strategy that is going to help you make high quality videos that sell. Easy Video Suite is the Tool that you are going to use to make videos and my “Zamurai Video Guide” is going to teach you how to make great videos that offer good content but don’t ramble on FOREVER. Most new video marketers struggle to make proper videos because they don’t really know how to start or finish a video properly which usually causes them to ramble on forever, or having to record a video over and over because it just doesn’t seem right. Has this ever happen to you? Well with my Zamurai Video Guide you are going to learn a simple yet POWERFUL 3 Step formula to use for EVERY single video you ever make to make sure you get your message across as effective as possible. And I’m not only talking about screencast videos this formula works for powerpoint videos, video sales letters, just about any kind of video you can make online. I will also let you choose any one of my other products (if you don’t already own them) 100% Free. I am really looking forward to sending you my bonus once you purchase EVS. I’ll send you the download link for my bonus shortly thereafter. Any questions? Leave them below. …You’ll also have the perfect bonus..
…if you get it through my link right now. P.S.S. I am going to be limiting my bonus to the first 30 action takers on EVS. EVS + ZCTA + ZVG COMBO! If you found this review helpful why not hit the like button below? If you have ever wondered how to create “Photoshop type” Optin forms for your WordPress Blog then watch this short video below. and I didn’t even use ALL the functions and features of the plugin yet. If you rather not watch my review you can go straight to the UGLIEST sales page ever HERE! LITERALLY! Hey Hey Guys! I have a very exciting article to share with you today! I recently posted a status on my Facebook wall about how I outsource my content writing for my niche sites and how it can free up a lot of time to focus on other things. . There were a few people that seemed to be interested in learning how to find a great and inexpensive content writer. So I decided to put together this article to share with you how and where to find the best seo content writing services. There are two main companies I use and so far I have had a great experience with both. So let’s jump right in and cover the 2 SEO content writing services I use just about every week. 1. 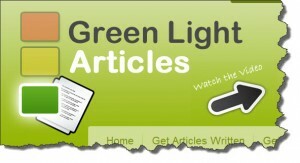 GreenLight Articles: These guys here have some of the best and inexpensive content writers. The owner of GLA is Colin Klinkert the same guy who put together SocialMonkee which is one of the services I use for Social Bookmarking so I knew the level of value to expect when signing up for GLA. The great thing about GreenLight articles is I have never had to physically edit an article myself after placing my order. The article comes ready to publish and all I have to do is add my intro, my conclusion, my header tags, images, video and BOOM it’s ready to go. The reason I add an intro and conclusion is to optimize it for my keywords, add my links to other blog posts, and to inject my personality into it so this is 100% optional. Another great thing is I recently placed an order to have them write a press release for me and it came out extremely well. It cost me $8 when professional press release writing services cost between $300-$500 so if you would like to have a press release written GLA is good for that too. Just one con of GLA is it’s a little more expensive then the next service I will be covering BUT the quality is a bit better and you have a much better chance of the article being ready to publish. Be sure you ALWAYS tick the option to review the article first as well. That way you can choose to accept the article or not if for some reason the quality is not up to par. 2. iWriter: iWriter operates a little different but a lot less expensive. I have ordered over 60 articles from iWriter already and it’s where I order the bulk of my articles. I have to say thank you to Jamie Hudson from ConqueredRiches for introducing me to iWriter it is absolutely an amazing resource. c. Your article get’s broadcasted to their network of writers and one of them chooses to write it. d. You are notified when an article is complete and you have the opportunity to review the article and choose wether to approve or reject it. If you reject the article it gets put back into the pool and other writer’s can have a crack at it. You could however choose from their featured writers on the homepage and see if they’d be willing to write for you but I have seen that most of them take on only the higher paid projects. You do have the option to pay them more if you’d like. The way I recommend you use iWriter is load between 3-5 articles and wait for them to be written. Of those you will have one or two which are of superb quality. From there you can message the writer who wrote the articles you like and see what their availability is like. If they say they’re available you can continue to hire them over and over. By doing this I have been able to build a group of 5 writers who write well which I keep quite busy. That way I can evenly distribute the articles between them and get more done in half the time. On the other hand when loading your articles you can choose to have your article displayed to 4 and 5 star rated writers only but you will be paying more as I mentioned before. Since you will be paying between $2-$5 per article expect to get some EXTREMELY bad writen articles at first. But once you reject the bad ones and sort through the good ones you will start to build your team. It may take you a little longer to find a good writer as opposed to GLA but you are paying a lot less. You may also have to fix a few grammar or spelling issue here and there but hey for $3 per article a few minutes of editing is fine with me. That is pretty much it my friends these are the seo content writing services I use week in and week out. If you are looking to outsource your content sign up for one or both and start getting your articles written. If you Found this Article Helpful Why Not Give it a Thumbs Up? Hey guys today I want to share with you my article samurai review after being one of the lucky 500 to get in on the first launch. As of today it has been 1 month since I signed up with article samurai and I am super impressed with the ease of syndicating articles and more importantly the ranking results I’ve received in return. 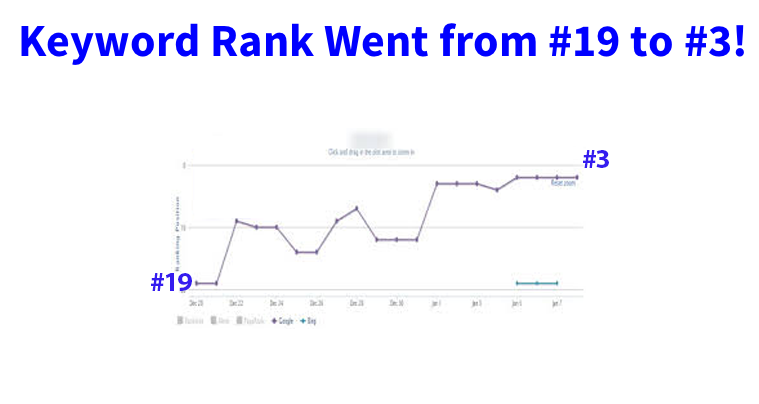 As you can see from the video above before using article samurai I was able to get my sites to low page 1 High page 2 rankings from other backlinks methods and once I was able to get some article marketing backlinks my ranking improved dramatically. I took the screenshot of this on my Market Samurai Rank tracker the day I purchased Article Samurai for the purpose of keeping track of my results. So as you can see my rankings were ok but not bringing in the traffic that I wanted due to being mostly on page 2. I was absolutely AMAZED! I have slowly but surely climbed the ranks over the last 4 weeks and I’m just getting started! It’s not like I have syndicated a TON of articles I’ve done about 2 per site (I have 7 websites) which is NOTHING compared to what I could be syndicating if I had more time to write. If you can see the red number 6, that particular site is in the web hosting niche and after being pushed to page 1 brought in it’s first 2 sales this past Monday the 19th! That is right $100 in a day from a website which I’ve just set up about 2 months ago. The site is relatively new and already produced it’s first 2 paying customers. I am absolutely STOKED to continue syndicating articles and reach the #1 spot! 1. Article Marketing STILL WORKS! 2. High quality Blog Networks WORK! That’s what I’ve learned from this whole experience and I look forward to reporting back when I reach the #1 spot and the sales really start pouring in! I hope this article samurai review helped you out and unfortunately Article Samurai is NOT available for sale to the public BUT I will be sure to let you know when it is. "FREE - $3,128 Per Month With Simple Videos.."
Unlock My Personal Blueprint For Making Passive Income From YouTube, Step-By-Step..
2 of 2 – Are You Missing The High PageRank Boat? My G+ Stamp of Approval!